The iGuard SuperMaster server is a back-end data server designed to enlarge the actual storage capacity for connected iGuard readers whenever more than one thousand users are registered. To support a great number of users, the SuperMaster acts as the Master iGuard on the LAN/WAN and all LM520 iGuards are set up as slaves. With this settings, the slaved iGuards operate in storage cache mode, keeping the most recently used 1000 authorized local users in storage.on the local iGuard, if the registered user cannot be located in the local iGuard's cache, the slave iGuard will request the movement of the owner's information from the SuperMaster via the network. The information with this user will be kept in the slave iGuard (if authorized), replacing the oldest personal information recorded if the local unit has reached 1000 user capacity. Features: Fully Compatible with ALL iGuard LM520-FOSC or LM520-SC Slave Units. NOT COMPATIBLE with LM520-FOSC-SP Master ONLY Special Priced Unit. 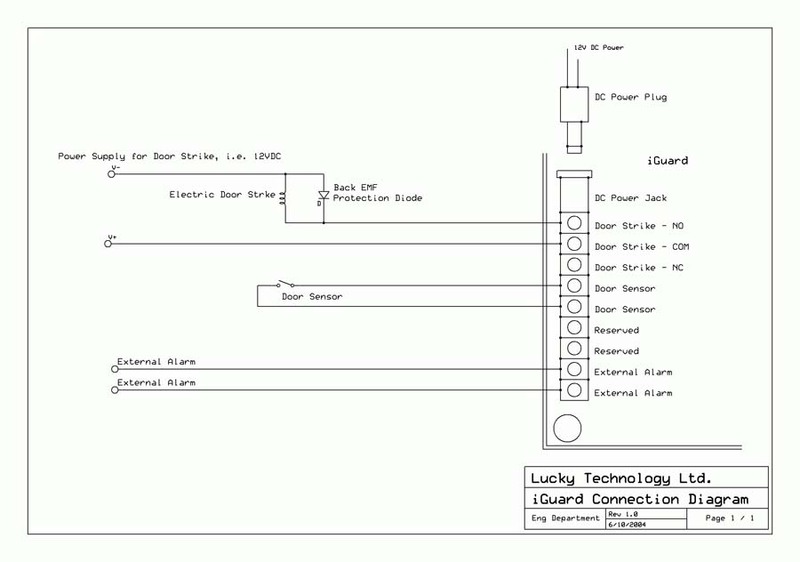 Lucky Technologies iGuard is Compatible with Mac, Linux or Windows networking environments or as a stand-alone unit on any LAN/WAN configuration with a simple RJ45 connector or a Wireless Ethernet Bridge to a wireless b/g/n network. iGuard requires no additional software. All the administration and maintenance can be performed via any web browser such as Android Browsers, Safari (IOS or Mac), Firefox, Internet Explorer, Google Chrome or other IP based browser software. iGuard SuperMaster is Compatible with Mac, Linux or Windows networking environments or as a stand-alone unit on any LAN/WAN configuration with a simple RJ45 connector or a Wireless Ethernet Bridge to a wireless b/g/n network. The iGuard SuperMaster may be used for up to 20,000 users with other iGuard LM520-FOSC units or iGuard LM520-SC units. Additional iGuard LM520-FOSC/LM520-SC units may be networked with the SuperMaster via WAN or LAN connections. All employees' information, including their individual access rights and privileges, will be automatically synchronized to all devices in this configuration via TCP-IP. Fingerprint Only - also known as "automatch" for up to 100 users (This is an upgraded special configuration provided by iGuardDirect.com only - standard is 30 users for Automatch). User ID and Fingerprint - up to 1,000 users with an LM520-FOSC network or up to 20,000 users with the optional iGuard SuperMaster. User ID and Password - up to 1,000 users with an LM520-FOSC network or up to 20,000 users with the optional iGuard SuperMaster. iGuard Smart Card and Fingerprint - up to 1,000 users with an LM520-FOSC network or up to 20,000 users with the optional iGuard SuperMaster. iGuard Smart Card and Password - up to 1,000 users with an LM520-FOSC network or up to 20,000 users with the optional iGuard SuperMaster. Smart Card Only via Quick Access - Quick Access is an access control feature of iGuard which, when activated, allows employees to access the premises without multi-factor authentication. For example, during the Quick Access period, employees can just use smartcards to gain access without fingerprint or pin verification. User ID and Password - up to 1,000 users with an LM520-SC network or up to 20,000 users with the optional iGuard SuperMaster. iGuard Smart Card and Password - up to 1,000 users with an LM520-FOSC/SC network or up to 20,000 users with the optional iGuard SuperMaster. The iGuard SuperMaster's built-in 20,000 record database server allows convenient setup and retrieving of employee information & their access log records. All the information can be accessed via web-browser real-time, instead of spreadsheets of day-old or week-old data. Users may be segregated into 256 different departments each with their own access rights and privileges. There are three system passwords accessible via direct input or via web-browser: System Admin Password, User Admin Password & Door Access Passwords. iGuard enables managing the access rights of each individual employee or a group of employees easily anytime, anywhere using computers or mobile devices via internet. For example, you can limit the employees of the marketing department rights to get into the office premises during weekdays from nine to five only, or prevent a particular employee from entering the computer server room. iGuard uses the latest fingerprint sensor from SecuGen, providing unparalleled speed and accuracy for fingerprint authentication whether using Verification (Smart Card/UserID & Fingerprint or Identification (Fingerprint only AKA Automatch). iGuard is designed to be directly connected to the corporate computer network and to the Internet via the standard RJ-45 cabling. Connection of the optional power supply can be achieved through a direct 12v multi-voltage (100-220v @ 50-60Hz) plug-in adapter or a 2.5mmx5.5mm center positive discrete 12v power supply with an included battery backup. We recommend for fire system integration, security system integration and local building code compliance that these power supplies be purchased and installed by a LOCAL 12V CERTIFIED ELECTRICIAN. Our power supply of preference for a single iGuard and door strike (12v ~500mA) is the Altronix AL175-ULX which has two discrete outputs at 12V with sufficient headspace for both iGuard and Strike power requirements. The built-in Database Server can save up to 20,000 access log records. If you want to save all these records permanently in PC, you can download them each week/month or you can use our iServer.exe (available here) which will automatically get all access log records from the registered Master iGuard unit, and save these records in the PC in ODBC database format in real-time. All SLAVE unit iGuard records automatically roll-up to the SuperMaster iGuard for download or safe-keeping. Each iGuard has its own network IP address (e.g., 192.168.0.138). You can configure this address and other network settings, such as subnet mask, gateway and DNS via the keypad. Although the iGuard will work with DHCP or Fixed IP we ALWAYS recommend FIXED IP configurations for iGuard units and we further recommend that you remove these IP's from your DHCP server provisioning. When installing multiple iGuards on a single power supply, with or without door strikes, we recommend using discrete power for each iGuard and each door strike with an N4004 diode between each iGuard and Strike power leads to eliminate back EMF per our installation diagram. 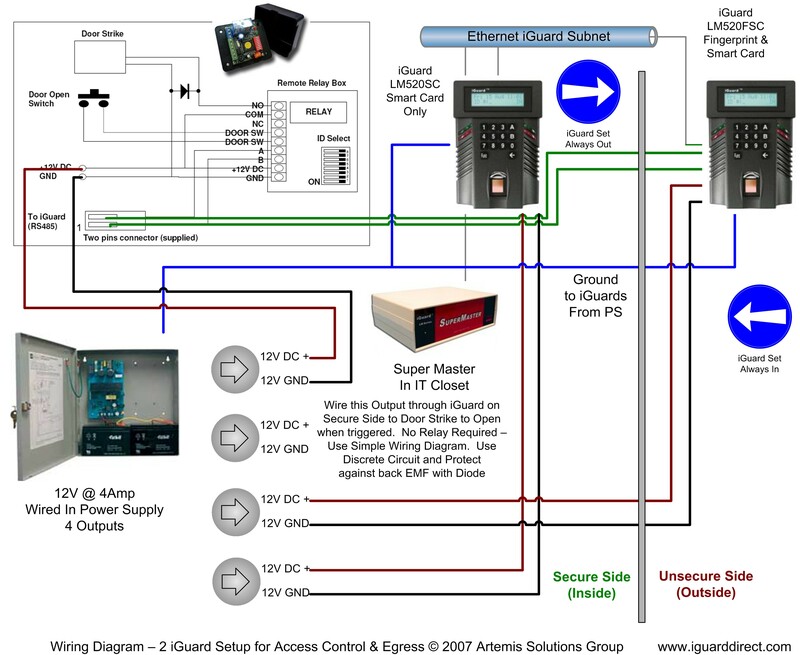 Installing 2 iGuards for a single door is possible for ingress/egress control. 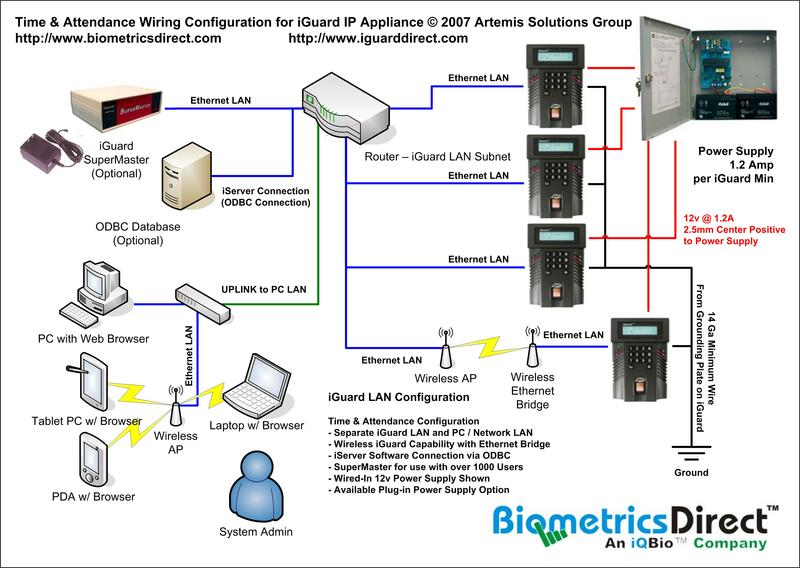 Our installation diagram for multiple iGuards/door is a good guide.